With a group of us trained to lead CFGs, and a refreshing update from the SRI Winter Meeting, we can now imagine how to grow a culture of learning and sharing among colleagues that will, in turn, result in deeper, more joyous, and differentiated learning for our students. The challenge is taking the first step of honoring the collective knowledge that surrounds us. The second step is opening our classroom doors and discussing, questioning our practice and learning by bouncing off the ideas of others. During my 24 years of classroom teaching I had the privilege of working in a co-teaching arrangement that meant two professionals were focusing their talent and attention on one group of students. Over the years I had a variety of co-teachers. Each of them interacted with and challenged my ideas, shared their own inspirations, and were willing to experiment and struggle to meld our various strengths and experiences into a lively, every-changing program that responded to the interests, talents, and needs of our students. Yes, we made lots of mistakes and there were plenty of lesson ideas thrown back on the table to revise. The wonderful part was having a colleague dedicated to the same project (helping our students learn) and equally willing to try, try again. My co-teachers were my first “critical friends” in an “old school” sort of way. We didn’t reach outside our classroom, in fact the culture of the school was to keep your doors closed and create your own unique environment unsullied by the ideas of other teachers. No “copying” allowed. I am grateful to have had co-teachers in those days to have learned the value of collaboration and discovered how two minds really do think better than one. We are now beginning to take the plunge and trust that the collective wisdom of all our colleagues will reveal new ideas and open up new ways to refresh our teaching. By listening and sharing, we establish pathways to those minds for future consultation, formally or informally. In turn, we share our own inspirations, wisdom, and experience with others to help them get “unstuck” or frame in a big idea. In both directions we have gained, and beyond the smaller group, the community has been strengthened through a culture of risk-taking, challenging assumptions about teaching and learning and a fierce determination to grow. Most importantly, the work we are doing with children is constantly reinvented to provide students with the best opportunity for joyous inspiration and deep learning. Out of many we are strong. CFGs make us humble, but also give us insight into new ways to look at our own practice and rethink some of our assumptions. I feel uncertain each time I bring something to a CFG, questioning even the value of the project or dilemma I decide to present, but if many hands make light work, then in a CFG many minds make great work. There’s no patent on our good ideas, they are meant to be shared and augmented in surprising ways by people we may have not yet recognized for being amazing. COPPA, the Children's Online Privacy Protection Act, was devised as a way to ensure that young children are prevented from sharing too much information online, and that sites do not purposely reap information from them. William Stites has done a great job running down the requirements COPPA puts on websites in his blog post: Dealing with COPPA: Compliance, the lies and the future. With a review of COPPA taking place tomorrow, I want to put together my thoughts about why COPPA hinders, but may also help parents and educators of young children. I recently attended a wonderful session sponsored by FOSI in which Alice Marwick, Amanda Lenhart, and dana boyd presented their recent research about teens online, then discussed issues with the audience. dana boyd's research clearly shows that COPPA has created a culture of lying online. Children (my son included, by his own admission) under 13 routinely alter their birthdates to join sites independently. While this is not a surprising behavior in the absence of directed teaching about the reasons COPPA exists, it is more concerning to learn that boyd's survey revealed that parents often encourage their children to lie about their age in order to circumvent the terms of service on websites. When asked, they state that they assumed the age restriction was just a suggestion, and that the parent could make the call. Similarly, teachers encourage students to create accounts on sites such as Khan Academy in order to augment their curriculum, without realizing that in order to join the site you must log in with an already existing Google or Facebook account. The choice for your 4th, 5th, or 6th graders, who will benefit greatly from the material on the site, is to encourage their parents to create one of these accounts for their kids - in other words, to lie about their child's age. Those schools incorporating iPads into their program have similiar issues with the need to create iTunes accounts for updates and app purchases, but are faced with the 13-year or older restriction for the creation of these accounts. 1. When asked if their parents knew about the "religion", the kids said yes. When I asked the parents what they knew, they said they thought it was a funny joke, but did NOT realize the home address and personal information was being posted on the Internet. In fact, they hadn't shown their parents the acutal site. 2. When I asked to see the site, the eight year old assured me that it was password protected and I wouldn't be able to find it. I used Google while they stood there and we found eight hits, all live, including the address of the child's house in the subtext of the hit. 3. The parents were thrilled that these enterprising children knew how to create a website. It did not occur to the parents to check on the privacy settings of the site. The children assumed that what they did started as private and they would have to change the settings to make it public. In a perfect world, I would like teachers and parents to be the ones who make the call about when it is important for a child under 13 to have access to the rich web 2.0 opportunities that many websites offer. I would also like teachers and parents to be educated about how to guide these children in their educated, thoughtful, safe use of these tools. We still suffer from adults who throw their hands in the air and say, "The kids just know so more than I do about these things!" I'm sorry, I do not accept that excuse. Educate yourself. Test the tools. Read the articles. Protect your children by teaching them, interacting with them, and talking to them. Include media literacy and digital citizenship lessons at every grade level, integrated into every topic. If we, as adults, don't take the responsibility to actively teach our children, the laws like COPPA need to be there to keep reminding us of our jobs - yes, even if such restrictions make our lives more difficult. I am spying on the Chris Lehmann Keynote at MSET via Twitter this morning. It's fascinating to pick up the fragments and imagine the whole. Here are some crumbs from "Building Schools 2.0" to work on, thanks to many busy Tweeters through the keynote. Great thoughts! "How many of you think your schools get it HALF right?" Only about 10% raised hands. Yikes! "Deliver pizza, not instruction" "We need to reclaim the language." "We TEACH." "Don't ban cell phones. Why deny them the tools if you can't afford the tools?" "They're going to use them anyway." "[So teach them how to use them!]" Not changing how we teach is more about us than the students. Are we willing to unlearn and relearn? "What are our own personal slide rules?" What are we teaching that is now outdated? Schools should be student centered. When you go into the classroom, you should play "find the teacher". What if we challenge students - "High School is Real Life" What you do now does matter, your passions are what matters. "If you get 30 copies of the same thing you didn't give a project you gave a recipe. Let them own it." technology need to be like oxygen. It should not be something special. Technology is like oxygen - ubiquitous, necessary, and invisible. "When was the last time you took your kids to a pencil lab?" Tech should be everywhere. What we Want for Kinds we MUST also want for teachers and the school. Empower Kids - It is their education and it will be THEIR world. What do we teach kids? We teach them wisdom. This year I volunteered to tweet for the NAIS conference, held at National Harbor, Maryland (across the Potomac from DC). The theme was "Monumental Opportunties: Advancing Our Public Purpose". As ever, the line-up of keynote speakers was fabulous and perhaps the most valuable experience, outside the great networking opportunities that always take place. Reviewing my tweets, I realize that the actual theme was closer to "Making Good Choices and Guiding Change". What follows are a collection of my tweets which I think will sum up the most important takeaways. Understanding choices. Sheena Iygenar's keynote The Art of Choosing was a wonderful guide to rethinking the way we guide and manage others. Relationship between leadership and choice - as leaders we are defined by our choices. Effective leaders don't just empower themselves with choice, but others around them as well. No choice or too many choices - workers felt leaders were either dictators or incompetent. Choose with wisdom and compassion towards others and you are on your way to mastering the art of choosing. The Hole in the Wall project. Sugata Mitra described his experiment with computers and village children. He has made fascinating observations about how children can and will learn by developing their own pedagogy. Left learners with a problem with no pedagogy - the children developed the pedagogy. When teachers can be replaced by a machine, something needs to change. When learners have interest, they learn. The rider, the elephant, and the path. Dan Heath spoke about the topic of this book, Switch: How to Change When Change is Hard. We say change is hard, but we accept change willingly in so many instances. There are times we embrace it. The emotional part of our brains is like an elephant, with the rational part the small rider at the top. Who wins? Analyzing problems comes naturally, analyzing successes does not. Successes can point the direction for successful change. Find the "bright spots" in your school. Why are the best teachers, best students the way they are? Study your bright spots. What looks like resistance is often a lack of clarity. - Ambiguity is the enemy of change. By shaping the path the change becomes easier - when the situation changes, people change. If you want change, failure is part of the deal. Struggle en route is inevitable. Democracy requires an educated public. Elizabeth Coleman of Bennington College gave an impassioned talk about the importance of broader, deeper thought. No more damning evidence of the education in this country than the quality the public demands from the media. We have professionalized Liberal Arts to the point that they don't provide heightened civic behavior, which was their hallmark. The values and voices of democracy are silenced with devastating consequences. We only have ourselves to blame when we hand over responsibility to someone else. You have a choice. You get no credit for moderation if you are just applauding the status quo. Go for the gold. The future of knowledge, talent, and innovation. Anya Kamenetz views education from an unusual perspective. She emphasized that there are so many ways to learn now, that traditional education is outdated and insufficient. Her comparison was the demise of the music industry - has it killed music? No, quite the opposite, now there are more ways to access music, publish and find an audience, and participate than ever before. Conforming in the name of accountability we focus on left brain skills and we lose creativity. The Future is Open - Content, Socialization, Credit/Assessment are the three buckets. PLNs - YouTube - we help each other learn- spontaneous learning in the wild. Schools should jump on it! How technology can humanize the classroom. Salman Khan spoke with energy and enthusiasm about the way tutorials like his can flip the school experience, providing students the time they need to absorb difficult concepts, then allowing the teacher the opportunity to build on their knowledge. Learning from online tutorials offer more options - repeat, review, move ahead, struggle with the concept. No one is watching you. Flipped the teaching with tutorials: Technology humanized the classroom - kids are teaching each other and teacher gets to mentor. Khan's vision is by seeing how students do on site, it can increase student - to- valuable time with the teacher ratio. Self-paced learning - who are the fast or slow students? Maybe the fast ones were just assessed at the right time. Disruptive technologies used well can actually humanize the classroom. I am sorry to say I had to leave before Geoffrey Canada spoke in order to get back to school. Overall it was a wonderful series of keynotes inspiring making good choices and guiding change. Is the “Business” of Digital Citizenship Preventing Progress? As long as internet safety and digital citizenship are presented as a business, with products to be purchased to prevent problems, curricula that purport to immunize children, and professionals required to deliver messages, it’s no wonder that parents and teachers are paralyzed by the prospect of helping children negotiate their lives online. At the Family Online Safety Institute (FOSI) Annual Conference, held in Washington, DC last week, there was a striking confluence of those who view digital citizenship as an extension of our daily roles as citizens, and those who have a vested interest in keeping the alarm bells going in order to draw parents and teachers into their camp for speaking engagements, stand-alone curricula, web-tracking, web-blocking, or mobile phone tracking services. Mike Ribble, co-author of ISTE’s Digital Citizenship in Schools, started a rumble that was picked up by successive speakers when he stated that it is time to drop "digital" and talk about citizens that are using technology and how they are using it. Similarly, Anne Collier of Net Family News and ConnectSafely.org suggested we recognize that our online activities are so integrated in our daily lives that we should shake off the old context of a separation between "virtual reality" and reality. That puts our digital and non-digital behavior back in the realm of parents and classroom teachers – it stops being a business or sensational new story and goes on the list of “everything I learned in kindergarten”. The need for children and adults to understand the importance of Internet Safety and Digital Citizenship has spawned multiple non-profits and a plethora of for-profit offerings that promise to come in and make it all better for school systems and for parents. Since our culture has lost the “I can do it” attitude and now values the pre-packaged and store-bought over things that are actually homemade, we are lured into thinking that doing it ourselves is just too hard or will be insufficient. But in the end, what could be simpler than the Golden Rule? The bottom line is always the golden rule – teach empathy, tolerance, civility, and how to stand up for ourselves and for what is right. Teach it at home, at school, in every class. Integrate it into dinner table conversations; bring it up in the gossip sessions in the car on the way home from swim practice. If all of us, parents, teachers, leaders of all types, feel empowered to create their own messages, we might not be able to make a living out of digital citizenship, but we would more rapidly succeed in creating better citizens both in virtual reality and reality. Our school has asked us to imagine what attributes our students in the class of 2024 will have when they graduate, and how will our school need to change and adapt to meet their needs in the coming years. We met to discuss this seemingly distant future with our Board's education committee and a group of curriculum leaders for grades PK-4. A wide ranging discussion ensued, including visions of the future demand for world resources and the resulting need to be more resourceful and environmentally aware, and the need to be connected globally, not just to impoverished countries that need a share of our bounty, but to cultures across the world that are as developed as ourselves and therefore give us a different perspective on ourselves. We wondered about how to balance the future of online courses and connections with the eternal need for personal relationships and emotional growth and development. There was hope we will provide our students with the tools and attitudes that will make them innovators, creators, and collaborators. But the conversation just kept coming back to one main theme: we need to give them time. Time pervaded all of the discussion, as can be seen in the word cloud. Time for students to relax and discover things, to play outside in unstructured moments, time to delve into a subject that inspires them and actually take their ideas to a conclusion, time to breathe and cultivate their thinking, time to focus on studies that are important to their development without the burden of homework for homework's sake. 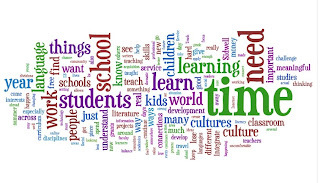 Of course the time issue related to our teachers as well: time to learn new ways of approaching students, time to develop authentic ways to integrate technology, to teach more languages, to be able to offer service learning experiences both locally and abroad. The big questions that emerged in the end was the ever-present issue of our school schedule, both daily and the annual school calendar. In order to offer additional language courses, the opportunity to explore robotics or other engineering in depth, to develop meaningful relationships across neighborhoods and borders must we extend the school day? the school year? Do we change the schedule to a more European model where school sessions are punctuated by longer, more frequent breaks but school continues through most of the summer? It will take much creative thinking and willingness to change our familiar routines to meet the goals of our lofty brainstorming. There are solutions, but they are not necessarily rooted in our current conceptions of what is important and therefore will require a leap into the unknown - not a leap educators are comfortable with as a rule. I look forward to continuing this discussion as our schools wrestles to define itself in the future.